I just brought home a new PDC and I am curious how others have set-up their attics - what do you typically store there - do you use all the compartments for screws and bits? Would appreciate reading and seeing some examples to get some ideas. garry! i need this...how can i make it happen? thanks! When youre feeling depressed just treat yourself to a systainer even if its a mini systainer its ok.
Tee, Lee Valley sells Tanos systainers, including a SysII with attic lid and also the Bit Storage Tray for Systainer® Case with Lid Storage. . You can either do a search for Tanos which wil show the entire line, or the fore mentioned discription. I've bought quite a few Tanos and other items such as their Veritas® Mk.II Honing Guide System. Great vendor three thumbs up!! Some of the bits are from the Centrotec Installers set, and there's a Veritas tapered plug cutter in there too. I basically bought two 769094 bit assortments (the second just to get the plastic bits basically! ), a 769093 wood bit set, and a 492512 3mm Centrotec wood bit. Murphy! I thought this thread was about storage in a house's attic. Doh! Kapex, CT-SYS, SYS-Cart, Pro 5 Sander, CT36AC, TS75, MFT 1080, MF-SYS/2, PS300 EQ-Plus, Parallel Guides Set, LR32 SYS, RO 150FEQ-Plus, OF1400 EQ Plus, DOMINO 500 Q-Plus, Domino XL, MFK 700 EQ-Set, FS-SYS/2, CT22 w/hose storage, D36HW-RS-Plus, FS 1900/2, FS 3000/2, FS 1080/2-LR32, FS 1400/2-LR32, Gecko, Festool Floor Mat, Festool Stein, Multi-Tool, tape measure, large and small Festool floor mats (foam rubber). Excellent pics...love seeing the set-ups. Anyone use it for screws? thanks for the info ! awesome! thanks for the spoon feed gerry! This is on an Imperial Installers Set 201312. Good idea ... the added labeling on the self-centering bits. Hmmm, one 1/4" wrench................ that must have a specific use? Ya it does Seth...combine that 1/4" ratcheting hex wrench with any short 1/4" hex drive bit and the combo can get into any small area that was impossible before. Think single metal electrical boxes mounted to studs through the sidewall of the box. Enjoy what you do. Build something. This has by far been my favorite attic setup. 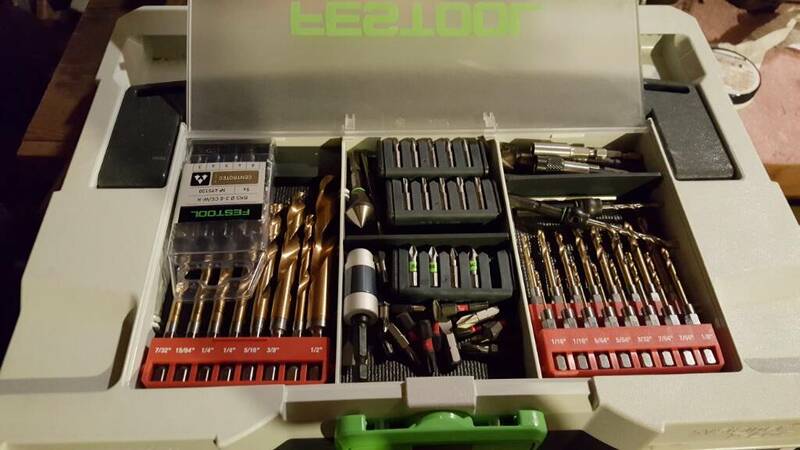 The Milwaukee titanium drill bit set fits perfectly. What is the bottom lined with, @Staniam? Looks like a great set-up. What is the bit in the bottom left of the attic, @GarryMartin? Looks like a counter sink bit. Like the one in the top middle of my picture. And a smaller counter sink next to it. If you mean the very bottom left, it's one of the Festool Deburring countersinks from the Installer Set. If you mean the third in from the left, that's the Veritas Tapered Snug Plug cutter. I really enjoy using the attic storage system for my most commonly used bits plus some additional "nice to haves" that when you need them and you discover you have it, it's like winning the lottery. Thanks - I have not seen a "deburring" bit in NA. Very cool. FWIW...here's a shot of 7 different sized countersinks. Far left is a Norseman in moly tool steel, the next 4 are from Keo and are made of cobalt, while the last 2 on the right are from Festool. All are meant to be used on wood, plastics and non-ferrous metals such as aluminum, copper or brass. Because the Keo's are cobalt, they could be used for lightly deburring steel or stainless. Most countersinks are available with 60º, 82º or 90º ends. All of those pictured are 82º which is used for the common flathead screw. The countersinks Cheese is showing are Weldon style and common for working non ferrous metal and are available in lots of different sizes from metal working distributors. I like te attic storage too. Very handy for the most used bits and drills. Thanks for the front picture! Very helpful. I looked like a tenon cutter or something from the back view. Contents in the smaller segments might switch around a bit, but I really like to have the "ultimate" needs in order in the center and then be able to just throw anything I might need right in.